Egypt would probably not embrace alternatives to the two-state Solution, but it prefers something to nothing. Prime Minister Binyamin Netanyahu's words are reverberating throughout the world, but thus far there has been less of an excited (or agitated) reaction to them as there has been in places like the White House. The head of the Arab League, Nabil El-Arabi, dismissed the comments as “electioneering.” The Egyptian government has been virtually silent. “I was surprised by his reaction. He was very outspoken against Israel before he headed the Arab League,” says Zack Gold, a research fellow who specializes on Egyptian Affairs with the Institute for National Security Studies. On Egypt, however, Gold discussed the virtual silence. "I haven't heard anyone talk about it since he said it. For Arabs generally, he seemed to say out loud what many of them already thought anyway," he told Arutz Sheva. Egypt has a more open cooperation with Israel now than it did even during the regime of Hosni Mubarak, who was deposed in 2011 in the first of two major leadership changes in Egypt over the last several years. 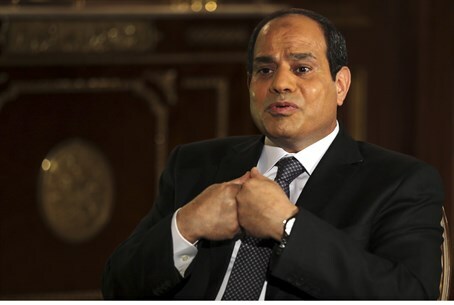 But the transparency Egypt would like to have with that cooperation is limited by the fear that if things broke down into open conflict again, the Egyptian President would be under immense public pressure to cut off ties that he has a serious interest in maintaining. The current President, Abdel Fattah al-Sisi, has anchored his presidency on beating back Islamism in its political and militant forms. Just two weeks ago, he spoke in glowing terms of his security cooperation with the Israelis. "The Egyptians didn't want to be involved in the Israeli elections," says Gold, who remarks that al-Sisi refused to be too emphatic about advancing the Palestinians' cause or a common defense cause with the Israelis during the campaign. Israeli politicians apparently were eager for the Egyptian President to make comments on one or the other issue, but "he demurred when the opportunities were offered." Gold says that Egypt is eager to see some sort of traction on the Israeli-Palestinian front, suggesting that al-Sisi is more open to new ideas than leaders of the past. One of them was something he had not heard openly discussed in Egypt beforehand: the deployment of Egyptian troops to a Palestinian state as a buffer against a Palestinian regime's collapse. "By saying he was open to Egyptian troops (peacekeeping in a hypothetical Palestinian state) in a way that assures Israelis of their security, I thought that was creative." On the question of whether or not Egypt thought that a process of any sort would be helpful, including alternatives to the Two State Solution, Gold called it "an interesting question" though did not expect Egyptian enthusiasm. "Certainly for Egypt there is a good amount of value in there being a process rather than stasis," he said. Gold was confident that a plan like Naftali Bennett's would not be something the Egyptians would go for, but it might depend more on the Palestinian leadership than the Egyptian one. While Gold would not endorse any particular plan that would be immediately acceptable to Egyptians or Arabs in general, he did note that it was while a process of some sort was happening that Israel had the chance to open diplomatic tracks with Arab countries, but which tend to fade out with new conflicts. But al-Sisi might still be more eager to have things moving more for his own benefit than the benefit of the Palestinian Authority. Al-Sisi is interested in strong security cooperation with Israel, particularly on Ansar Bayt al-Maqdis, the terrorist group waging war with Egypt in the Sinai Peninsula. The Sinai group recently pledged allegiance to ISIS, which in turn labeled the Sinai a 'province' of their caliphate. "There are certainly ties between ISIS and Ansar Bayt al-Maqdis, but they are less logistical and more based on communications and public relations,” said Gold. Ansar Bayt al-Maqdis has a heavily Bedouin component to its ranks. The same tribes that populate the Sinai have branches in the Israeli Negev, raising the stakes for Israelis and Egyptians if family ties bind a desert connection to the northeast with ISIS fighters in Syria or Iraq. "The ties though are not very strong, but there are some connections. The major concern is smuggling, some of which might be going to terrorism," said Gold, adding there is also a "fear of growing ties between Ansar Bayt al-Maqdis and ISIS followers in Libya." Netanyahu also asserted the argument that an independent Palestinian state in Judea and Samaria would be vulnerable to its overthrow at the hands of Islamist groups. While the concern for a long time had been a Hamas takeover, there is now concern that ISIS may try to generate an organic following in Palestinian areas also. But Netanyahu has not made that argument to al-Sisi, at least not strongly enough just yet, as al-Sisi sees a strong Mahmoud Abbas as the best guarantor against that happening. Clearly, Netanyahu does not see it being enough. Gold referenced comments by Jordanian leaders that the Israeli-Palestinian conflict served as a rallying cry for extremists. When asked if he thought that argument had weight, he could not say that that would have the overarching result a number of people might want. "Solving the conflict might solve some problems, but I don't think it's the end-all, be-all. It wouldn't end all the conflicts in the Middle East; all the civil wars."